Do you have a pet that sheds? The pet hair gets everywhere and it can be a pain to control. This is why it’s important that you consider a Shark vacuum for your home. These are generally affordable and have the features that you would need. However, it’s important to read through some of the Shark vacuum cleaner reviews before making your decision. Here are a few features you should look for. Type: Do you prefer a canister, upright, or stick type of vacuum? This sort of comes down to whether or not you have storage space for a vacuum based on its size or if you just like the way one performs over the other. Bagless: Bags or no bags? There are pros and cons for each type. It really is a personal choice. So if you have a choice, check out this information. Power: This isn’t a huge deal breaker for me, but there are folks who choose their vacuum based on whether it has a cord or not. Cordless is best for larger homes so that you don’t have to keep plugging it in after each room. Pieces: The number of pieces mean how many accessories are with the machine. The number of accessories varies between models. So if you need the extras, pay attention to this category. Weight: If you have stairs that you’re going to be carrying the vacuum up and down on, then you won’t want something super heavy. Pay attention to the weight of the machine, especially if you have issues carrying heavy objects. Warranty: A warranty is important. This shows that the manufacturer stands behind their product. Most of the time there will be a one to seven-year warranty with Shark products, maybe even a lifetime warranty. Alright, let’s get down to business. If you are looking for a Shark vacuum, then this handy Shark Vacuum buying guide will help you immensely. Finding the best Shark Vacuum for pets is more than just about the price. So make sure you are keeping in mind the features from above. 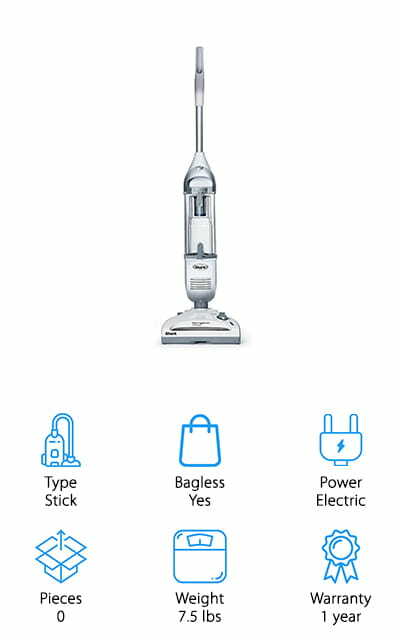 Now, if you’re ready to find the vacuum of your dreams, let’s start off with our top pick. If you’re on a budget, check out our budget pick if you’re in a hurry. The Shark Rotator TruePet has been selected as our top pick out of all the shark vacuum models for various reasons. One of the main features of this particular vacuum is the canister detaches to that you can get to those hard-to-reach places without having to struggle. There are also some handy fingertip controls that allow you easily switch from hard floor to carpet mode and turn the device off. The anti-allergen complete seal technology plus the HEPA filter helps trap 99.9% of dust and other allergens that may be floating around the house. You will also get some handy attachments that will help you clean more efficiently including the pet brush, multi-tool, and more. There are also some fancy LED lights that help you navigate through those dark corners of your home and the swivel steering help you do to do flawlessly. It’s definitely the ultimate in pet hair cleanup. Even though this is considered the best cheap shark vacuum, it still performs well. This large-capacity vacuum is powerful and lightweight with an easy-to-empty dust cup. With its 25 foot power cord, you can go through many rooms in your home without having to unplug the cord. 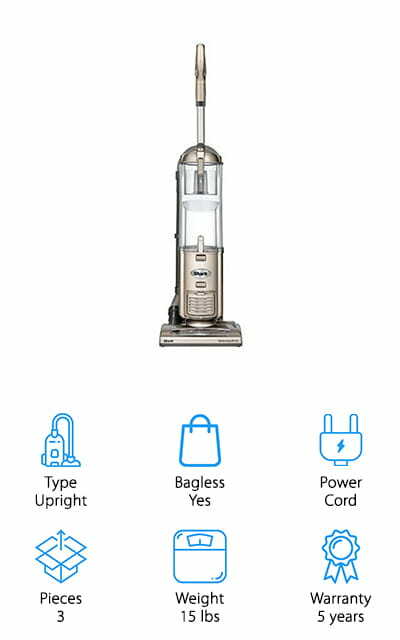 This top rated Shark vacuum has “Never Loses Suction” technology to ensure your suction stays the same throughout your whole cleaning process. Along with all that fancy technology, you will get various attachments to maximize your cleaning. You can switch from hardwood flooring to carpets with just the push of a button as well. The Shark Lift-Away Pro is an upright vacuum with a canister that is easy to empty for your convenience. You can also lift the canister away to get to those hard-to-reach areas. It comes complete with the anti-allergen complete seal technology. This ensures that the HEPA filter traps and locks 99.9% of the dust and allergens that may be floating around your home. This powerful little vacuum weighs only 13.7 pounds. Lightweight vacuums are great for those who may have trouble lifting heavy objects, especially up and down stairs. With the brushroll shutoff, it makes going from carpet to hardwood flooring a breeze and you’ll never have to worry about scratching your floors. 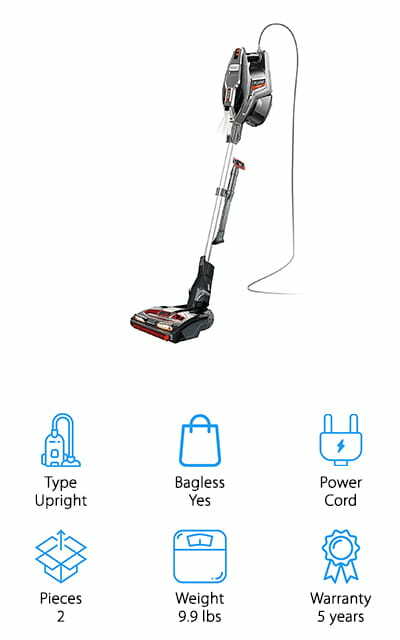 For the many reasons, listed above and the Shark vacuum reviews, I can safely say this would be the top shark vacuum that's both affordable and versatile. With your purchase, you also have access to a one-year limited warranty for your product. If you are looking for the best Shark vacuum for sale that is ultra lightweight and easy to carry around, the Shark rocket TruePet would be what you are looking for. This Rocket is a step above the original in that is has a bigger dust cup for holding all that nasty stuff you clean up. This allows you to clean longer without having to dump the cup as frequently. 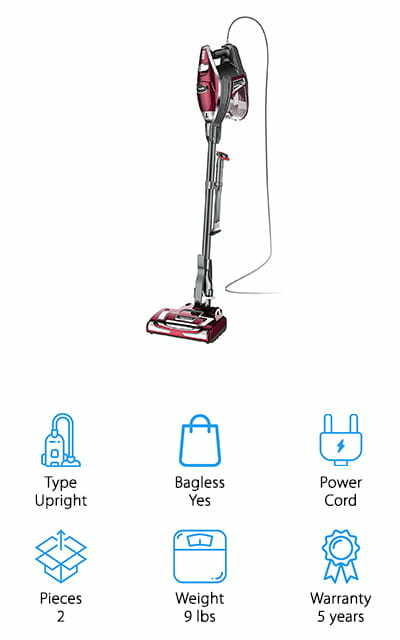 This Shark model converts to a handheld vacuum for easier and better floor-to-ceiling cleaning. The pet multi-tool comes in handy when you have to capture all that built-up pet hair from your shedding dog deep within the fibers of your carpets. The LED lights help you do this in dark places within your home. 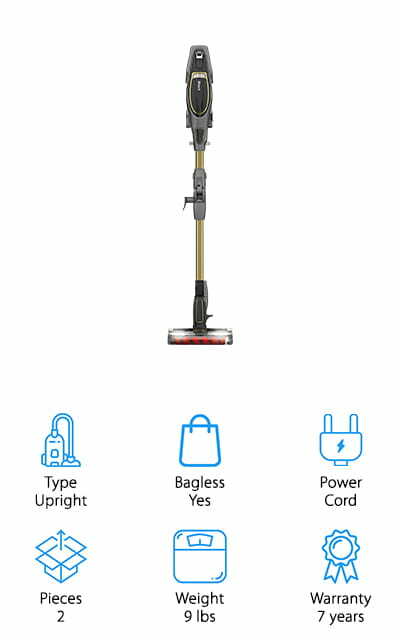 Here’s the kicker when it comes to this vacuum-it has advanced swivel steering that allows you to maneuver around furniture easier and without the hassles that come from other vacuums without swivel steering. This is one of the best rated shark vacuums on the market for several reasons. One of the main reasons is because of that DuoClean technology. This is a brush that deep cleans the carpets along with an additional brushroll to pull in the larger pieces of dirt. This may leave your floor looking polished and beautiful. This is also an ultra-lightweight vacuum that converts into a hand vac that weighs a mere 4.6 pounds. This is perfect for stair and other above-the-floor cleaning. The LED lights will help illuminate those dark corners for easy viewing and the swivel technology helps maneuver around these corners and under furniture. With the purchase of this particular Shark model, you get the pet multi-tool and the duster crevice tool. Here’s the kicker, you’ll get a handy wall mount storage hook as well. Also, it can pick up those large pieces of food that may have been dragged into the dining room if your dog is anything like mine. If you are looking for the best Shark vacuum cleaner that you can get on a strict budget, then consider the Shark Navigator Freestyle. 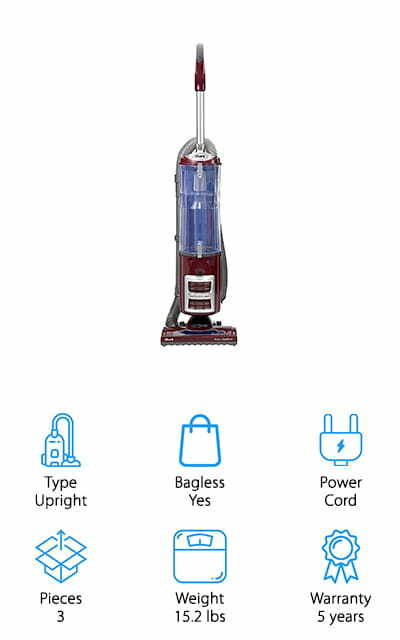 This vacuum has some pretty great features for the low price that you are going to pay. First, it’s a stick vacuum, so it’s going to be easy to store and use. It only weighs 7.5 pounds, so it’s ideal for those who can’t lift heavy objects. It runs on a 14.4 volt battery that can be recharged, so you can go from room to room without a cord being in your way. It charges in around four hours and it also doubles as a storage dock. The two-speed brushroll is great for cleaning both carpets and bare floors and it picks up pet hair quickly. There’s an extra large dust cup that catches all the pet dander without releasing it back into the air. When you compare Shark vacuum models, this one may be the best Shark vacuum for carpets, especially if you have a lot of it in your home and a lot of pets. The Spark Apex features that DuoClean technology that we have seen in most of these models. However, it also has noise reduction and active-glide technology that gives you an ultimate cleaning experience that would want from and full-sized upright cleaner. The powered lift away allows you to remove the canister to better clean those hard-to-reach places. When combined with the active-glide technology, you have smooth maneuverability on both floors and carpets while the vacuum keeps its suction power. There’s also noise reduction technology has been tuned to help reduce the noise that comes from it and it even softens the pitch. What’s more is the advanced anti-allergen complete seal. This feature emits 10x fewer particles than HEPA standards want. Overall, this is a great vacuum. If you are looking for a higher end vacuum and want one that has all kinds of goodies with it and performs like a champ, the Shark IONFlex 2x has what you need. This product is cordless and comes complete with two lithium ion batteries that can be recharged without having to be mounted to the wall. It comes with a table-top charger for one battery at a time while the other is in the vacuum. The multi-flex technology allows you to reach under furniture easily and the DueClean technology brings you a bristle brush that deep cleans the carpets and a softer brush to pull in particles. It converts to a handheld vacuum so you can clean above the floor, in the car if your pet rides with you, and more. With the purchase of this vacuum, you will get the duster crevice tool, multi-tool, anti-allergen dust brush, charging dock, and the batteries. Here we have another Shark vacuum with plenty of features to keep your home pet hair-free. First, it is equipped with multi-flex technology that allows you to reach under furniture in a breeze. The DuoClean technology is another handy feature. It’s a bristle brush that deep cleans carpets with an additional soft brush roll that pulls the particles up and out of the carpets while directly engaging the floor for a more polished look. It is specifically designed to pick up hair and pet dander from both floors and upholstery. Not to mention, it traps allergens related to your pets inside of the vacuum. The Anti-allergen complete seal technology captures 99.9% of these allergens down to one micron. If you need to clean above the floor, it easily and quickly converts to a handheld vacuum for your convenience. You can glide smoothly over all floors and carpets with powerful suction thanks to the active-glide technology. The Shark Navigator DLX bagless vacuum features anti-allergen complete seal technology that lets the vacuum capture and keep 99.9% of dust and allergens inside of the vacuum. There is a huge 3x dust capacity that keeps more dust and dirt so you can clean for longer periods of time. The vacuum moves on smooth glide rubber wheels, allowing you to move effortlessly around your furniture. The swivel steering technology also gives you the ability to move around the furniture and from room-to-room with ease. The extra long 25-foot power cord makes it so that you can vacuum multiple rooms while hooked to just one single outlet. 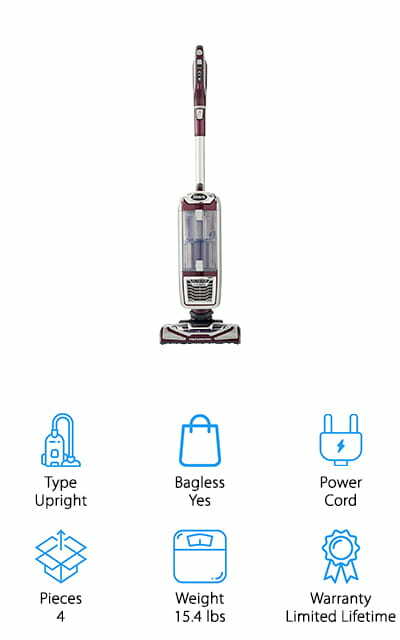 With this vacuum, you also get premium pet tools that help you clean your home more efficiently. You’ll get a dusting brush, crevice tool, and wide pet upholstery tool. One more thing, there are three different colors that you can choose from including blue, green, and red.